I decided to take a brief video of one of my last residential projects in Pleasanton, CA involving the installation of a keyless entry unit. If you’d like to bypass this post and get straight to the video, please scroll down to the bottom of the page. This is my second project for this client. They have a nice looking oak wooden entry door (stile and rail) on their home. Unfortunately, they inherited one of those Weslock interconnected handlesets and it started giving them problems and not functioning properly. When I checked it out I could see that it needed to be replaced. However, the issue with these Weslock interconnected handlesets is that the space between the holes for the latch and the deadbolt is a very irregular spacing (2-7/8” center to center). To my knowledge, this spacing is not used by any other manufacturer. If you want to replace it for another Weslock, then it’s easy. However, we knew we weren’t going to go with another Weslock. My first project on this door entailed replacing the Weslock interconnected handleset with an Emtek handleset. We chose the Creston tubular entry set in a flat black patina finish. This Emtek is a large piece of hardware and my client and I chose this one for two reasons: aesthetics and size. It’s a long handleset. Therefore after I patched the holes left from the previous Weslock I was able to cover them up completely with the new Emtek. It’s also a good quality piece of hardware and I knew it would look really nice on this application. I also installed a 12” strike on the frame to better secure the frame (there were some signs of weakness there such as small cracks) and ensure a secure fit for the latch and deadbolt. The extra-long strike also adds additional aesthetic value. The project turned out quite nicely. Unfortunately I don’t have any before pictures but you can see the pictures after the Emtek has been installed below. However, my client still wanted a keyless entry unit. I opted for the Emtek entry handleset since I knew I couldn’t switch out that Weslock for a keyless entry unit due to the spacing issues. A separate deadbolt and knob/lever can’t be installed so close together. So, I told me client we would go with this Emtek first and if they still wanted the functionality of a keyless entry unit we could install one of those as well. Less than a week later my client contacted me to move forward with the keyless entry project. I did a bit of research to find the right keyless entry unit for my client. First, my client wanted to be able to go keyless (and enter with a code not a key). Second, my client wanted an auto relock function – to be able to have the door lock itself automatically after closing. Third, I wanted to ensure we get a nice looking keyless entry unit so it matched the finish and style of the Emtek I previously installed and was aesthetically pleasing on both the outside and inside of the door. I decided upon the Arrow V2 Revolution keyless entry touchpad deadbolt. It provided everything we were looking for and ended up being a very nice lock. The Arrow finish (oil rubbed bronze) is a very close match with the Emtek flat black. 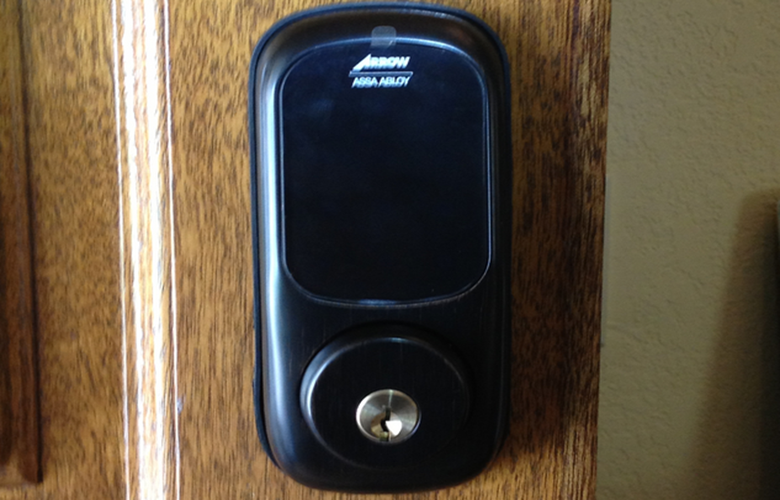 Here’s the video that shows the installation of this Arrow keyless entry touchpad deadbolt. You can see how nice the door looks at the end as well. I like to know arrow key less locks will fit our thick door? the thickness of the door is 2 5/8 inch. Or arrow has a kit that will make the regular lock to fit in thick door? I like the auto lock and totally key less. As far as I know, Arrow doesn’t make a thick door kit to accommodate a door as thick as yours. I believe their thick door kit is for doors up to 2″ thick. Your door, 2 5/8″ is non-standard as you probably already know (the standard exterior door is 1 3/4″ thick). I do know that Emtek makes a thick door kit and I believe it can accommodate doors up to 3″ thick. However, I don’t know what specific hardware will work with that kit. Emtek would be a good start. I hope I answered your question. Just remember many things can be customized. Good luck with your keyless entry lock project! Schlage is a brand that is into lock-making business since 1921 and has an image of building innovative and durable locks. The Connect Touchscreen Deadbolt from Schlage is a perfect example of Schlage’s craftsmanship.